Name of the shortcut to edit. Use Control key as a modifier for the shortcut. Use Shift key as a modifier for the shortcut. 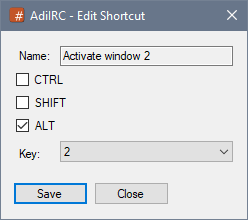 Use Alt key as a modifier for the shortcut. Key to use for this shortcut. If key is set to None, the shortcut is unset.